It was announced today that actress Charlotte Rae passed away at age 92. Although she is best known for her roles in "Facts of Life" and "Diff'rent Strokes", I remember her for playing Sylvia Schnauzer in "Car 54 Where are You?" Sylvia was the wife of Patrolman Leo Schnauzer played by Al Lewis, best known for being Grandpa Munster. 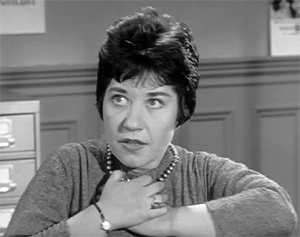 Sylvia was a recurrent character in the series which was on the air from 1961-63. She was very funny when she appeared. Hank Garrett who played Officer Nicholson is now the only living member of the cast.